Speaking about the future of Christian-Jewish relationships: the former Rhineland President Nikolaus Schneider, the President of the Union of Liberal Jews in France, Jean François Bensahel, and the Chair of the Council, Phil Cunningham. Calls for joint action came at the end of Conference of the International Council of Christians and Jews. Speakers at the meeting of the umbrella organisation emphasised that with regard to co-operation, dialogue was begun in the immediate post-war years and is still in its early stages. The former President of the Rhineland Church, Nikolaus Schneider, expressed his support for greater common commitment between Christians and Jews. Both needed to work together in standing up for a more just world, he said. His wish from the two religions, the one as much as the other, was for “greater impatience for the Kingdom of God”. Jews as well as Christians should revive their common hope in the coming of the Messiah and from that find their motivation for a commitment to justice and peace across religious boundaries. The relationship between the two religions “is defined in practice”, not just in religious dialogues. Schneider issued an urgent warning to the two religions against the corruption of political power. When Christianity was in a position to exert influence, it discriminated against Judaism and refused to engage in dialogue. The question of fresh involvement in power structures is now arising again today in respect of Islam, “and here I am also thinking of Judaism in the State of Israel”, said Schneider. To ensure this common commitment, the former President called upon Christians to refrain from missionary work among Jews. He welcomed the fact that the Evangelical Church in Germany had issued a rejection of mission to the Jews and had also condemned the anti-Semitic statements of Martin Luther. Schneider expressed his objections to the way in which supporters of the mission to the Jews based their arguments on the New Testament: “We have to prove to them that Scripture actually says the opposite. I believe that can be done.” In 1980 the Evangelical Church in the Rhineland was the first church to declare a renunciation of mission to the Jews. The President of the Union of Liberal Jews in France, Jean François Bensahel, called upon his religion “to recognise our Christian brothers and sisters and to say: you belong to the House of Israel!”. Christianity has been fundamentally reformed and acknowledges its Judaic roots. This transformation of Christianity would also change Judaism. “The house of Judaism is big enough for all”, said Benhasel. Both religions should recognise each other as God’s creation. In answer to Nikolaus Schneider’s question about whether Christians would be able to enter this Jewish house when bringing with them their concept of Christ as the Son of God, he replied with a smile: “That is a question for you to answer, not me”. The Chair of the Council, the Catholic theologian Phil Cunningham, gave a positive resumé of seven decades of theological dialogue between Christians and Jews. “In the last seventy years we have come further than in the previous 2,000”, he said. But this was not a reason for self-satisfaction. Both still had a long journey ahead “with the unlearning of reflex defences”. The question that now needs to be asked is whether the differences between Christianity and Judaism are unshakeable contradictions or a result of differing interpretations. 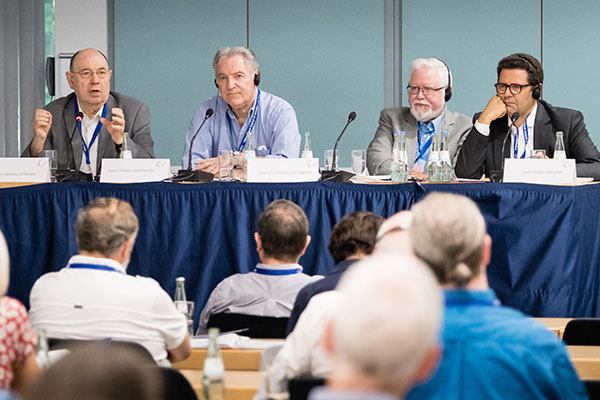 At its conference in Bonn the International Council of Christians and Jews focussed on the topic “Reforming, Rereading, Renewing: Martin Luther and 500 years of tradition and reform in Judaism and Christianity”. The Council is the umbrella organisation for Christian-Jewish co-operation in 40 countries. The Evangelical Church in the Rhineland was one of the co-organisers of the conference in Bonn.